As you have likely heard, Charlotte was home of the shooting of Keith Lamont Scott last Tuesday. This was another instance of a black man shot and killed by police, and a fight for truth and justice has followed. The event is still under investigation, yet the community has not paused to speak out. This all began less than a mile away from UNC Charlotte’s main campus. It seems so strange to me now to realize that the only thought I had put into the idea of a man with a gun as a college student in Charlotte was that I should fear for my own safety if someone were to terrorize our campus. I never put thought into the guns at the side of our law enforcement officers. School shootings were something I could imagine as a student- something I could fear. In all honesty, an unjust police shooting impacting my community was not something I had thought about very much. I am a white girl who doesn’t even resemble the mixed ethnicity I have in my blood through my Mexican father. Racial intolerance hadn’t presented itself to me in any ways but through the media and I know I had never found an emotional tie to the concept because of this. As an individual- as Hannah- I am learning. I confess that I have failed to educate myself more on the feelings of the oppressed in our country. I could not relate to the victims- I have always had a strong feeling of support from law enforcement, and I have never found myself fearful of an officer. I have never been in a situation where I feared that the color of my skin would change the way someone treated me. I never felt victimized, and as a result, I never reached out. However, the events which have occurred in Charlotte have been able to make me look at the entire situation with new eyes. I am a part of a new community, and I have made friends with people of every color from so many different parts of the world. Every person I have met has been unique for reasons that go deeper than skin. As a college student I recognize that we are all on this campus for a reason. As individuals we are seeking to educate and better ourselves. As a college we are growing a new crowd of people to fight for a better society. Today I watched my college do exactly that, and I learned a lot about my peers and myself in the process. Students on campus organized a peaceful march on campus at noon. 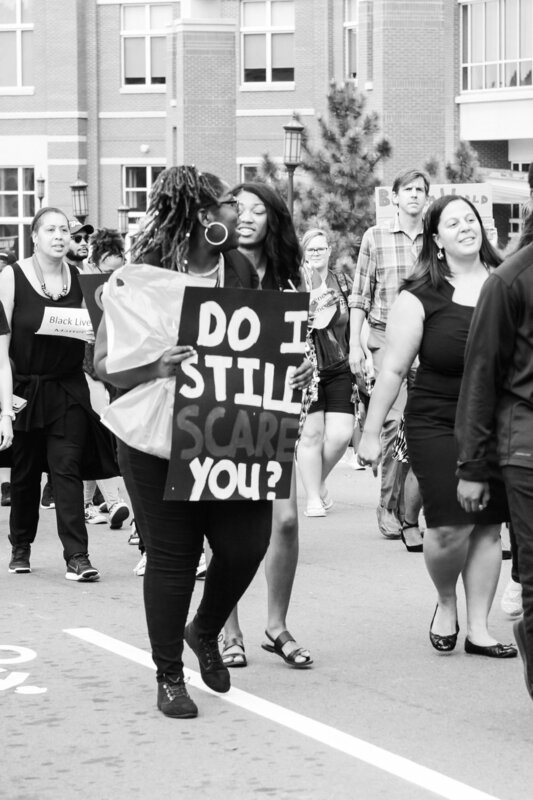 Joined by faculty, staff, and members of the community, our campus police made a safe route for us to make a statement- to "march in solidarity against racial injustice and police brutality.” At first there were about fifty of us in front of the union. Then there were a hundred. By the time we started marching, I felt like half of the school was out there. 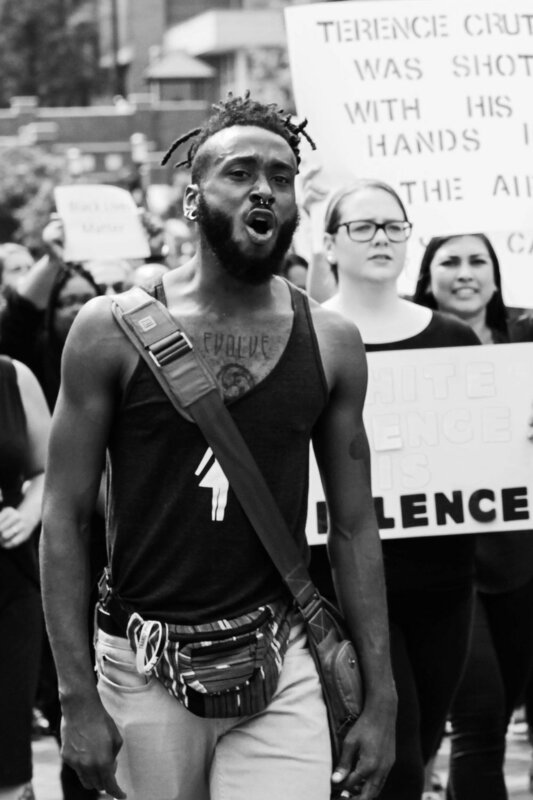 It was an incredible feeling to watch people of every color stand together to speak out. This march was something I am glad I took the time to witness and be a part of. I listened closely and kept my hands busy snapping photos left and right. I felt incredibly safe with this crowd. I watched as hundreds of strangers came together as one people, and I wanted to take this time to capture what they were saying through photographs. I am sad to know that we had a reason to march today. I am hurting for those around me who live with fearfulness. I am hopeful for a better future. I am proud of Charlotte. There are many reasons why I am grateful to be a student on a diverse campus within a city. Today I am grateful for the opportunity I had to be present and learn something that cannot be taught within these classrooms. Today, I am grateful for the community of UNC Charlotte.